Contradictory beliefs derive support from an organ called the hippocampus. Being a person's subconscious conviction regarding the truth of theories or facts, beliefs depend on neural pattern recognition structures. While people often hold opposing beliefs regarding theories, they generally share beliefs about facts. Those, who believe in the theory of evolution may not agree with those who believe in intelligent design. But, the belief that the earth is round is generally shared. While beliefs about theories and strategies derive support from the hippocampus, holistic cortical evaluation delivers the commonly shared beliefs about a wide range of established facts. Beliefs in theories and strategies are formed and strengthened by the hippocampus, based on subconscious goals and experiences. Since goals and experiences vary, people hold opposing beliefs and ignore facts, which contradict their individual beliefs. On the other hand, commonly shared beliefs in facts follow a cortical evaluation that the belief is not disputed by any known fact available to the system. Both differences and similarities in beliefs follow from the neural structures used by the mind to sense and recall patterns. In order to understand belief, the mystery of conscious awareness can be separated from the numerous explanations, which link the mind to activities of the nervous system. In order to understand belief, the mystery of conscious awareness can be separated from the numerous explanations, which link the mind to activities of the nervous system. The current explanations of beliefs range from a vague concept of a probable supporting data structure to the idea that all beliefs are false. The hippocampus is a neural organ, which provides space/time bookmarks for recording memories of sequences of experienced events. The hippocampus enables the assembly of an array of contextually linked route maps, which can enable an animal to reach a goal. Opposing beliefs are competing route maps, which can reach a commonly agreed goal. They may also be route maps to different subconscious goals. Intuition is a process, which focuses the mind by inhibiting access to irrelevant data, where a person effectively cannot see the view point of an alternate route map. The ACC selects optimum route maps for each individual and emotional commitment focuses the mind on a single route map – a single belief, opposed to other beliefs. Examples of how changed goals can change beliefs. A belief in a fact is a holistic intuitive process - you believe the earth is round, because there is no reasonable evidence in the entire database of your mind, which contradicts that view. A definition of belief can only follow from a coherent view of the relationship between the body and the mind – usually described as the “mind-body problem.” Modern philosophers continue to question how the subjective perception of color, or the experiences of intangible religious beliefs can ever be biologically explained. It is impossible to compare the levels of pain experienced by different people or to get a precise description of how it feels to have a belief. Conscious awareness is not measurable. David Chalmers suggested that we imagine a zombie, having all the physical aspects of a mind, except conscious awareness. We will never know if it actually has such awareness. William James suggested that the rise of conscious experience from a lump of gray matter was an "emergent phenomenon" - the way biology emerges from biochemistry. The phenomenon of conscious awareness remains a mystery. But, very few of the countless explanations of the activities of the nervous system have been denied. John Searle argues that the truth of the contents of mental states can be verified from their expressed assessments of the external world. In biology, the explanations of mental phenomena, founded on the central assumption that "there can be no change in the mental states of a person without a change in brain states," have been accepted. Neurobiology has investigated the relationships between perception and stimulation. Cognitive neuroscience endeavors to correlate mental processes to neural processes. Neuropsychology has shown the dependence of mental faculties on specific regions of the brain. Neuro-imaging has discovered many correlates between neural processes and mental functions. Evolutionary biology has linked the early origins and development of the nervous system to the development of the human mind. Over the years, science has lifted many of the veils, which covered the mind-body mystery. Can we establish a link between the ideas, which together form a belief? No link is possible between elements of a massive amount of data, unless there is a primary data storage structure. According to Braddon-Mitchell, a map like structure would enable different views of the same data by changing the viewpoints to different points on the map. Any semantic structure requires many inferences to be drawn, if there is a change in belief. And, there is no evidence that we consciously reason out all the consequences of a particular change in our belief. Smolensky suggested that reasoning networks, or connectionist links with weighted nodes could represent swift changing logical links. Dispositionalists and interpretationists suggest that outward behaviors can explain beliefs. A disposition to exhibit surprise, when a theory is proved to be wrong can indicate a belief. But, behaviors differ widely between people, who hold the same belief. A person may not carry an umbrella, even if he believes it is going to rain. Eliminativists argue that all beliefs will ultimately be proved wrong, with the advancement of science. The explanations of beliefs range from a vague concept of a data structure all the way to the idea that all beliefs are false. Science has already discovered a neural structure, which can link a group of ideas into a belief. They describe a belief structure, which enables animals to reach hidden goals. Theories and strategies concern sequences of ideas/actions, which collectively achieve goals. The goal of a theory may be to explain social behavior through an evolutionary model. The goal of a strategy – to reduce weight through an exercise and diet sequence. Both concern specific idea/event sequences, which lead to the achievement of specific goals. Such sequences are stored in a structured sequence in the nervous system. The hippocampus is a neural organ, which provides space/time bookmarks for recording memories of sequences of experienced events. The earliest role of the hippocampus was to enable an animal to remember the path to a hidden goal. They remembered and recalled the sequences of sensory and emotional signals experienced along the route to reach a hidden goal. In humans, the hippocampus consolidates and stores the declarative memories of events and experiences, including semantic concepts. Sidarata Ribeiro suggests that the wake-sleep cycle promotes propagation of memories outwards from the early coding sites and spreads this associative learning to extensive regions of the brain. The hippocampus uses its spacial navigation competence to provide context for converting implicit memories into episodic memories, which can be consciously recalled after months and years. The organ enables the storage of memories of the varied sequences of events consciously experienced by the mind. It enables the mind to merge and integrate the sequences of events and ideas, which form theories and strategies. With damage to the hippocampus, the nervous system loses its ability to bookmark, store and consolidate its episodic memories. The rat, which travels through a maze to repeatedly reach a food reward remembers all the sensory experiences, which relate the route to the prize. It remembers the exact path to be followed to reach its goal. Each time a person is faced with a decision to decide between several courses of action, he chooses one particular action based on his past experiences and emotions. The hippocampus links sequential memories, which achieve numerous survival goals. By providing a space/time/emotion context, the hippocampus constructs a route map for action in reaching varied objectives. If there is a block on a particular highway, we instantly know the alternate route to take. The likelihood of delays on particular routes is decided by an emotional decision to take a particular route. As the experiences of the mind multiply over the years, the hippocampus assembles a galaxy of route maps, which enable survival. The beliefs, which choose governments, keep diets, or apportion time for study or play are decided by subconscious goals. A belief is the semantic expression of the guiding concept, which describes the path of a particular route map to a particular goal. Beliefs concerning strategies/theories differ widely. The difference concerns the path to be followed to reach a particular objective. While objectives may be shared, people tend to disagree about the path to the objective. Major conflicts in belief concern the efficacy of government policies. A policy of increased government controls is in opposition to a policy of reduced government oversight. Both seek the welfare of the community. So also, opposing religious beliefs are universally supported by numerous historic events and ideas. All religions seek harmony in life. Both government policies and religious views contain linked groups of ideas. Different ideas and events lead to choices, which follow different paths. Episodic memories connect ideas and events along a particular path. As the enabling organ, the hippocampus stores, widely, personalized memories with common contextual threads, which can recall linked groups of ideas. 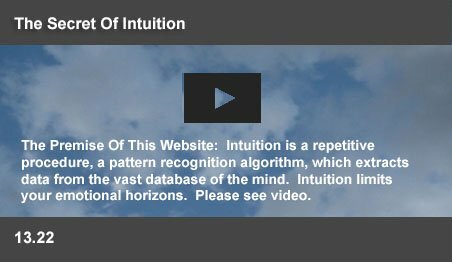 This website suggests that intuition is a pattern recognition routine, which makes the choices of the mind through a massive process of elimination. As was written "When a tiger bounds towards you, what should your response be? Should you file your toenails? Do a cartwheel? Sing a song? Is this the moment to run an uncountable number of randomly generated response possibilities through the decision rule?" 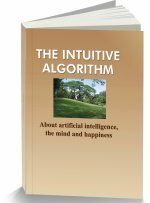 Intuition eliminates alternatives to reach each decision of the nervous system. The combinatorial codes (Nobel Prize, 2004) which recognize the smell of an orange from millions of smell patterns instantly eliminates unrecognized codes. The recognition code transmits the “belief” that the smell of orange has been recognized to all related neural subsystems. Intuition is an inductive routine, which uses the principle of exclusion to search for recognizable patterns. Exclusion makes logical sense. If an animal is pink, elephants are excluded from the search. Subsequent discovery of a pink elephant will make this induction wrong. But, if the reasoning that all elephants are gray is true, then the induction that a pink animal is not an elephant is equally true. Nerve cells become inhibited, if they fail to recognize a pattern. When seeking to achieve a goal, the mind selects a pattern representing a particular route map. In the process, the system excludes access to other route maps. Patterns linked to the chosen route map define a belief. Intuition inhibits access to the vast group of facts and events, which support an opposing belief. Contradictory facts appear irrelevant, when compared to the immense array of facts and experiences, which support the belief. During arguments about opposing beliefs, each person draws from an unending list of facts, which supports his own view, while his mind inhibits access to the opposing arguments. The principle of exclusion by the intuitive process explains the conflicting beliefs held by humanity. During a lifetime of experiences, an animal discovers many routes to a goal. For each successful trip to a food dispenser, the hippocampus of a rat registers the entire episode. All contextual details of each trip through the maze are registered extensively in memory. The mind assembles a galactic array of such routes, which can lead to particular goals. With myriad options, the exigencies of living demand instant decisions for survival. The anterior cingulate cortex (ACC) is believed to detect errors in expectations, enabling the mind to evaluate alternatives and make decisions. ACC decides from the levels of dopamine, which indicate the expectation that a particular answer is more likely to be correct. In tests, where subjects gained or lost money, dopamine production was small, with small gains or losses. Dopamine was not released for expected losses, but was released for losses, where a win was expected. As the animal continues to make its choices, its mind assembles a memory for the more successful paths to a goal. While there are several options, an animal is likely to habitually choose one particular route. In order to avoid a continual multiplicity of choices, the intuitive process inhibits memories of other routes. The chosen route becomes habitual and the choices along the way increasingly subconscious and instantaneous. Intuition inhibits options and prevents decision paralysis. So also, a person commuting to work may have a habitual route, out of several possible ones. His decision processes will choose this particular route as being the shortest, or the fastest. If his subconscious commitment to the route is defended in public, it becomes his belief. The emotional commitment to the route converts his knowledge into a belief. The process closes his open minded view towards alternate routes. There is a continual assembly of evidence supporting the chosen route. The belief is strengthened if he experiences any delays, while trying alternate routes. His system will dismiss similar difficulties on the favored route as irrelevant, in comparison to the benefits. A belief implies commitment to a particular route and the benefits of alternative viewpoints fade from his perception. A belief is triggered by an act of emotional commitment and causes a subconscious closure of the mind to alternative viewpoints. Various political parties diverge widely in their beliefs. While they selectively represent the interests of higher and lower sections of society, they are generally committed to the welfare of the people. Wide differences in political beliefs occur, because of the differing goals of particular constituents. The goal of a few concerned people in the higher strata of society is to improve their lives. They believe in improving systems so that people can earn more. Many in the lower strata have little expectation of significant advancement during their lifetimes. Their general goal is to prevent undeserving benefits from accruing to the upper classes. They ardently believe in strict punishment of the wrong doers. Beliefs are the subconscious convictions of people and are sincerely held. Such beliefs decide the free and secret voting choices of a person in the elections. Such elections lead to changes in government and massive policy shifts. These changes reflect the differences in goals of political constituents. Such goals can also have emotional grounds. After the brutal assassination of Indira Gandhi, her son, Rajiv Gandhi was voted into power by a huge majority of Indians. The prevalent goal of the Indian voter at that point was to make amends to Rajiv Gandhi for his tragic loss. The goals of millions of Indians, who had voted against the Congress Party a few years earlier changed. Across a subcontinent, political beliefs changed. Different goals lead to sincerely held, but contrasting beliefs. A belief causes people to act consistently. Vietnamese interrogators used consistency to make captured American soldiers to publicly denounce their country during the Vietnam war. The interrogators began with deprecating statements that America was “too perfect.” When the soldiers politely rejoined that “No, America also has problems,” the interrogators pressed the prisoners to defend their admission. The prisoners provided examples of “America's problems.” A goal of honestly pleasing their captors led to them discovering and listing many supporting facts. A confirmation by the prisoner of this view on television supported communist propaganda. When the prisoner told his interrogator that, of course, even America had problems, he had made a choice. The choice was decided by the goal of prisoner to please his captors. But, if the goal of the prisoner was to scotch this propaganda objective, he could politely interject that the problems of Viet Nam were worse. Thoughts of the immense poverty of the country would rise in his mind. His mind would rise to support his views. Consistency occurs, because the intuitive process fetches all the relevant data suitable for a particular goal. Consistency is merely the expression of a belief, which seeks to achieve a particular subconscious goal. Commitment to a particular belief follows a particular route map for achieving a goal. Such beliefs will be supported by numerous intellectual arguments. But, a person's goals may change over time. A change in goals may also follow a strong emotional input, such as the one which follows a distinct pain in the chest. A goal “enjoy life to the full” may change to the goal “prevent another heart attack.” When intuition focuses attention, the neurons in the focused area fire more strongly, while the surrounding neurons become inhibited. When visual attention is focused on a flower vase, the background will fade away. Similarly, a change in goals shifts attention to a new route map, while access to the previous route map, with its numerous supporting arguments fade away. The belief in the desirability of a triple decker ice cream suddenly fades away, while highlighting the argument for making “sensible” choices from a salad bar. Strong opposing arguments, which appeared valid a few days back just fade away. The mind now provides contextual information to a new route map – a new subconscious belief. Intuition deals with the whole. It eliminates all unrecognized categories from the whole list to focus on the answer. Neurons in the olfactory system store the inherited combinatorial codes of myriad smells. Over a lifetime, an animal adds millions more differentiated odors in codes. All cells in the system which fail to recognize the code of an encountered odor shut down. The animal instantly believes the smell is that of a predator. When you are queried about an undisputed fact, your mind searches its entire database in the blink of an eye. You believe the earth is round, because there is no reasonable evidence in the database, which contradicts that view.